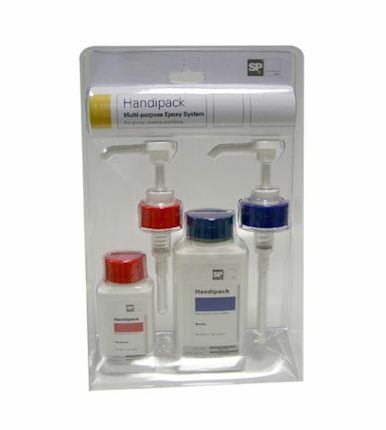 Handipack is a multi purpose epoxy, supplied in a small pack designed for quick repair work and other small tasks. It has a simple 2:1 mix ratio and dispensing is made easy because pumps are supplied in the pack. Used as a coating, it cures rapidly to form a tough, clear film, with good moisture resistance. By adding the appropriate SP filler powder, adhesives and fillers can also be made. The medium to low viscosity of the material enables it to be used for small laminating tasks, using lightweight glass fabrics, such as those from the SP reinforcements range. 375ml Pack with Pumps. 250ml Resin. 125ml Hardener.